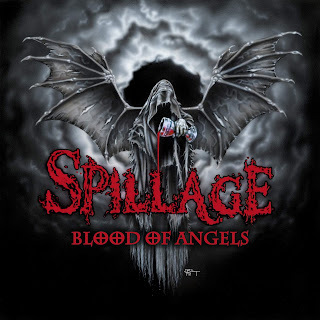 Epic, bombastic and quite a bit of fun, Spillage have crafted in recent yars what they brand as 'power doom' and there might not be a better term for their riffy and over the top approach to heavy music. While this band owes its debts to Iron Maiden and Trouble they are unafraid to tip the cap to more contemporary stoner and prog metal peers and it makes for something I can't quite get away from. Self aware ad poignant, Blood Of Angels is a crunchy little gem rising proudly out of the diverse Chicago heavy music scene. The real standout throughout the work of Spillage is of course the thrilling vocals of frontman Elvin Rodriguez, his voice, full of emotion and unafraid to delve into histrionics is a centerpiece of the music. Meanwhile, the keyboard padding provides a unique flavor to the band and really adds to the drama crafted by the strings. Massive sounding drums undercut a band with a distinct vision and a sound that is helplessly addictive and prone to keep drawing you back into the abyss. It's a rip roaring good time from a group who seem dedicated to their demonic evolution. Blood Of Angels is a veritable hellraiser and a record that can't help but to fascinate. Sure there are moments of this record that feel a little bit cheesy and elements that are just a little bit too over the top but who doesn't want that out of a band who bill themselves as power doom? You need to come at Spillage wit a certain self awareness, Spillage certainly do. They unravel their vast melodramas across stunning sonic vistas and it's clear that they have gotten nowhere near their full musical potential yet. I've been digging these guys from the start! It just bkeeps getting better!